Embroidery has reentered my life with gusto. It started with a lesson for my daughter last month and has only grown in momentum. On Monday and Tuesday, Laura and I introduced the joys of embroidery to over FIFTY 9-12 year olds. Teaching a 4 or 5 year old is vastly different. I'll talk a little about each today, but my focus will be on the young child. With this age group my goal is always to emphasize personal satisfaction and fun, rather than technique. My embroidery basket was such a hit on The Artful Parent''s giveaway and numerous parents asked me how to make one of their own. This post is for you. 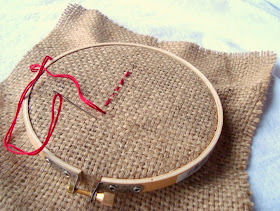 How ironic that the greatest material for beginning stitching is burlap... I think I might have some of that lying around! The loose weave makes it very desirable, but if you have a hard time getting your hands on some, any loosely woven fabric will do. Let's get started! To ensure success, thread your needle with about thirty inches of floss. Knot both ends together so that you have approximately 15 inches to work with. Any longer increases the chances of tangled threads. In the beginning, stitches will be wildly random. Encourage this freedom by having lots of colors available. You'll miss this expressive exploration when they move to the next stage.Trust me. I found that my daughter wanted to jump right into stitching along a pattern. So much, for wild abandon. 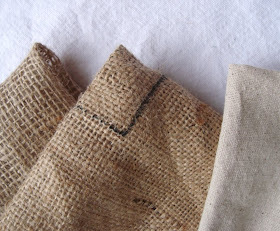 Use a sharpie to draw a simple shape, such as a square or triangle, directly onto your burlap. Next they may want a more complicated pattern, such as an animal face or simple design. When your child is ready for a bigger challenge, switch to a slightly sharper needle and more delicate floss. Every strand of floss contains 6 threads wound together. Divide into strands of 3 for your advanced beginner. Using a light colored cotton or linen, have your child draw their picture directly onto the fabric with a pencil. Stitch as before. If you begin embroidery with an older child, the steps and tips remain fairly similar, but you can start with a sharp embroidery needle, three strands of floss, and tightly woven fabric. Ask your child to draw a simple design on paper and then transfer to desired location on fabric. There are many schools of thought around the right way to embroider. I am in no way an expert. As in everything I do... I just find the way that works best for me. I did, however, enjoy teaching with Laura who learned to embroider in a college class (she has a degree in textile design)! She never knots her thread and teaches how to weave in tails of thread into the back of work. I liked this version with older children, as both sides stays tidy. We taught the children the back stitch as a good first stitch. I can't begin to tell you how enthusiastic they were. They couldn't stop! 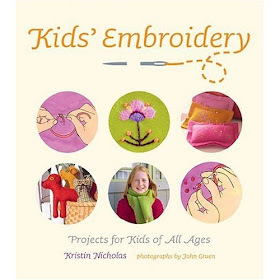 Kid's Embroidery is a wonderful book I've taken out of the library several times... and is now on our wish list. Doodle Stitching is another fresh and fun book for beginners. Embroidery makes the most heartfelt gifts! If you are looking to encourage your child to make something special for a loved one, this could be just the answer. From an elaborately designed picture to wild free stitches, embroidery makes a gorgeous keepsake. Frame it directly in the hoop by trimming away excess fabric and gluing the raw edges to the back. My son was one of those 50 big kids, and he's taken to embroidering every surface. He came home from school the other day with his black ski hat embellished with cartoon faces in thread! Both children have the embroidery bug, simultaneously! I can't tell you how amazing that is for me. 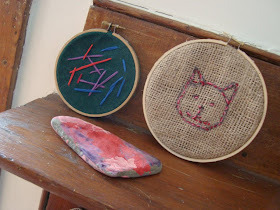 Each afternoon this week they worked, side by side, quitely stitching their own surprises for their Dad's birthday, Shh... that''s all I can safely say for now, although he was told not to read today's post... yet. One last bit of embroidery history... I fell in love with that sweet Birthday Daddy, when he embroidered one of his shirts with a moon and flowers for me 17 years ago. And on the collar, where only I could see... a little stitched heart. I really do equate embroidery with love. Happy Friday! embroidery is the very reason i was attracted to burlap back in '08. it makes such a great medium, especially for beginners. i would have loved to see you and your friend teaching embroidery to a room full of little ones! our neighbor friend recently discovered embroidery at our craft table, and wants to do nothing but stitch every time she comes over. thank you for all your tips and recommendations! Oh my. . .! I still have the embroidery on burlap project that I did in kindergarten. . . It has always been a favorite project & I love it still. When I saw your photos I was flooded with memories! Thanks! 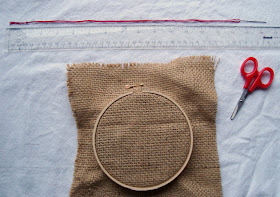 Those are great tips - I remember struggling with the spatial issues (where things go in and come out) when I was a 7-year-old learning to do cross-stitch. Nice suggestion to use burlap as a starter material... in fact, it makes me want to experiment with what I can do with burlap in a hoop! I can't wait until my son is old enough to try some stitching. oh that birthday daddy... how sweet. Love all your tips and tricks for working with the younger set! I want to get my hands on that kids embroidery book to take a peak.. it was fab teaching with you too! Great post! I love embroidering with my 5 year old son, although he only does it in about 10 minute spurts. He is working on an elephant outline that I drew onto some felt for him to follow. I know that it will be something that I will treasure. I also love your story at the end about why you associate embroidery with love. The "tips to teach" are very helpful. My four year old son has tried embroidery a bit and and have never done it so it is quite helpful to have the words to share with him. Thanks! I think I am going to try this with my almost four year old boy. He loves everything crafty and would really enjoy this! Thanks for the tips. My 3.5 year old just asked me to teach her sew. So I gathered some embroidery supplies and snuggled on the couch. It wasn't without some technical challenges with her grasping the concept, but it was loads of fun, and oh, the results! Wonderful Post! I started this with my own kidlets but I'm adding these books to my wish list. You are so brilliant! My oldest is almost four. I can't wait to get her started. She just loves "crafting". I always assumed I would have to wait a few years before I introduced her to this. 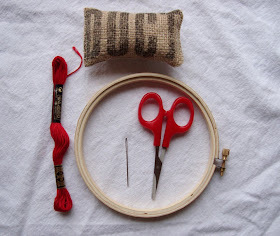 Great idea to use burlap for a beginning embroiderer. I taught all my kiddos to embroider when they were very young and they all loved it and a couple of them still stitch. Do you remember those sewing cards from our childhood? I just found a set of wooden ones to send to my niece who is three. so sweet! love the cat! i stitched as a kid and picked it up again around college... so therapeutic and love what it can produce! made necklaces and bracelets with my niece today, and taught her friendship pins... the safety pins with beads for her shoe laces... she loved them! Embroidering with kids is fun - we started last week and my youngest one just loves it. We have the same book (Kids' Embroidery)- I bought it a long time ago when they were way too young still for doing any sewing. I think it's a great source for fun projects - we made the stuffed dog and cat from the book and they turned out so, so cute...(http://pm-betweenthelines.blogspot.com/2009/12/sewing-too-kids-embroidery.html)! Thanks for the great tips! I would love to teach this to my 8 year old cousin when we go up for Christmas. I know she would love it! Awww. You made my heart melt. What a wonderful Daddy. Yes it seems your emroidery history has come full circle. Merry Christmas! Thank you so much for this post! I had picked up two copies of that very book last week for my daughter and niece and was hoping to put together a starter kit for them, now I know just what to include. Wow! Thank you! I always wanted to write in my site something like that. Can I take part of your post to my blog? Please come visit my site Business Trade Guide of Jacksonville Florida FL when you got time. Such a great post!! a little while ago I started embroidery with Sofia(8) that was one of the things I included in her sewing box I gave her for her birthday. She made her own drawing and embroidered that. A few month later I made her some simple shape animal stuffies and she gave them all a sweet face using emboidery, I did not have to explain anything or help and the end result is amazing!! Embroidery always makes me happy too!! Happy birthday Mr. Maya*made. You are incredible!! What a lovely post! I vividly remember learning to embroider and do cross stitch when I was a little girl - no surface was safe from my needle. Thanks for bringing back such a nice memory! That is fantastic! One of my fondest memories is trying to embroider/cross stitch like my mom when I was 4 or 5. It was just like a child's doodle-drawing, where the lines mean something to the kid drawing them, but they're really just lines :p Everybody's gotta start learning to do things somewhere! Look at how many people share a love for embroidery! It really is as easy as picking up a needle and thread and just going for it, though your tips are very helpful. Thank you! Thank you for this! My daughters are showing an interest in sewing/embroidery, but being a non-sewer it is hard to know where to start. Thanks for the perfect introductory experience! I am expecting a baby in March, and beginning a bookmarked list of things to do with my 4 and 2 year old as I sit nursing a new baby . . . this is a great addition to that list, thanks! love what you are all about! I embroider and repair the holes in socks with LITTLE RED HEARTS too. I was actually doing embroidery today with a 4 year old at pre-school and I got her to write her name, and I traced it on to a piece of fabric and dotted the area to sew (it was her first time). She was able to finish her "A" and that was fantastic! Often when we do embroidery with young children I bring out the beads that they can thread on as the sew...not sure if that is technically ok...but the kids love it! thank you for this post. we have been working on ideas for our Girl scout troop and this is a good one to add to our plans. thanks. At the end of the post I included a link to this post - I can't wait to introduce my preschooler to embroidering and this tutorial makes it look easy and fun! nice picture and nice post of Embroidery .i like it very much. Hi. I found your blog as I was trying to figure out what needles to purchase for my daughter's introduction to embrodiery. She is 4. I purchased these (http://www.createforless.com/Dritz+Hand+Needles+Sewing+Plastic+Blunt+Tip+2pc/pid216210.aspx) Dritz Hand Needles, and they are too blunt to feed through the fabric & felt (the embroidery project we're beginning with). I see that you recommend tapestry needles, and I've looked at them online, and there are tapestry needles in sizes ranging from 16-28. Could you make a recommendation of where to start? Thanks! I began teaching my 3 and a half year old little girl embroidery. Such fun! Burlap is great for children to start with. Also felt is great for little kids to sew on........so many great colors and cheap! This blog was a great help to know how to begin with my daughter! Thanks!